After reading a thread on here about modding a RS6 grill to fit an A4 I thought I'd give it a go. Pretty chuffed with the results. Let me know what you think. Craig Cull, CHEZ and MartayMcFly like this. That looks great! Where did you get the grille from? Imola Yellow A4 DTM. Retro fit cruise and arm rest. Looking good! 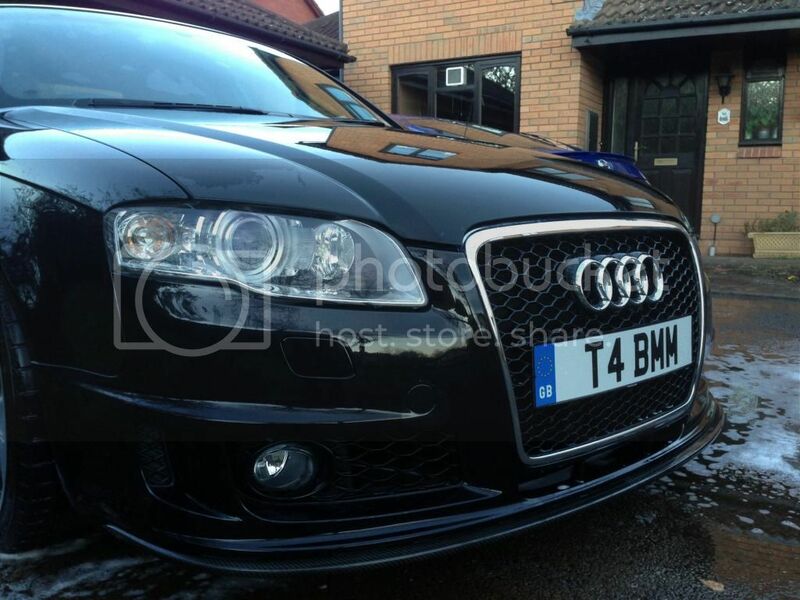 I've bought an RS4 grill for my DTM, just plucking up the courage to chop it up! Its an OEM RS6 grill that I got off ebay cut and stuck into the frame of an A4 grill. Pretty time consuming to do but defo worth it. Its like the one that Fly posted but has all honeycome and no plate mount in the middle. It is a bit of a scary moment when you make that first cut but the look you get once its all said and done is ace! 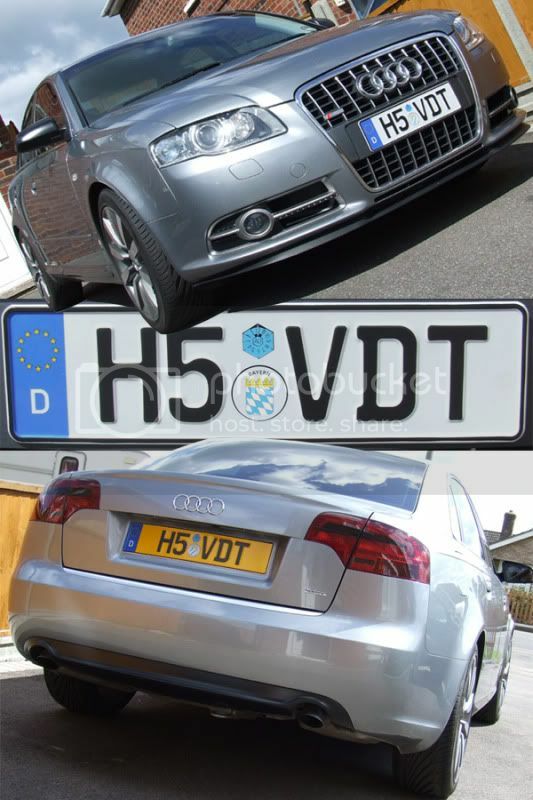 Looks the biz that does....although I would like the reg' plate holder on there too! Excellent looks perfect. Wicked Mod. Where can the grill be purchased?? 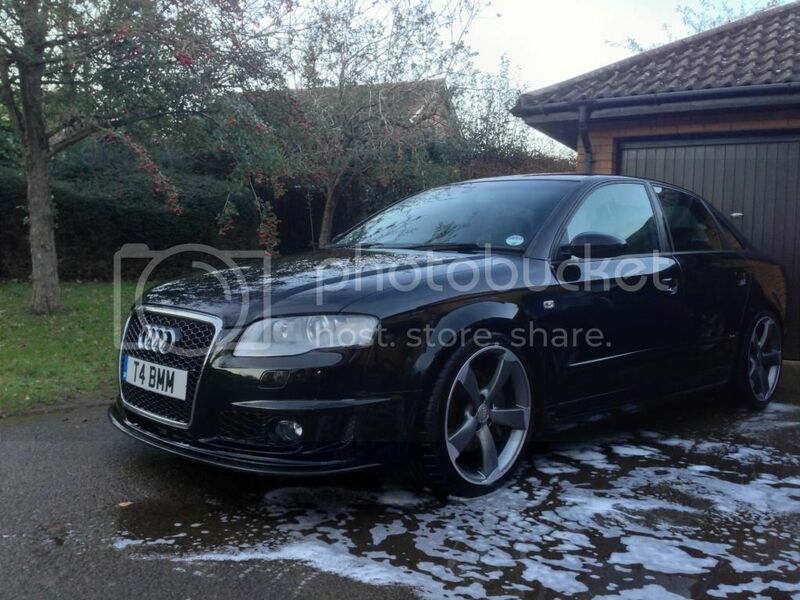 really nice mate... 19" rotors, clear corners, and do i spy some OEM RS4 mirrors too?? also what drop have you gone for - the stance is cool? thanks! Iv tried to keep all the mods Iv done OEM. 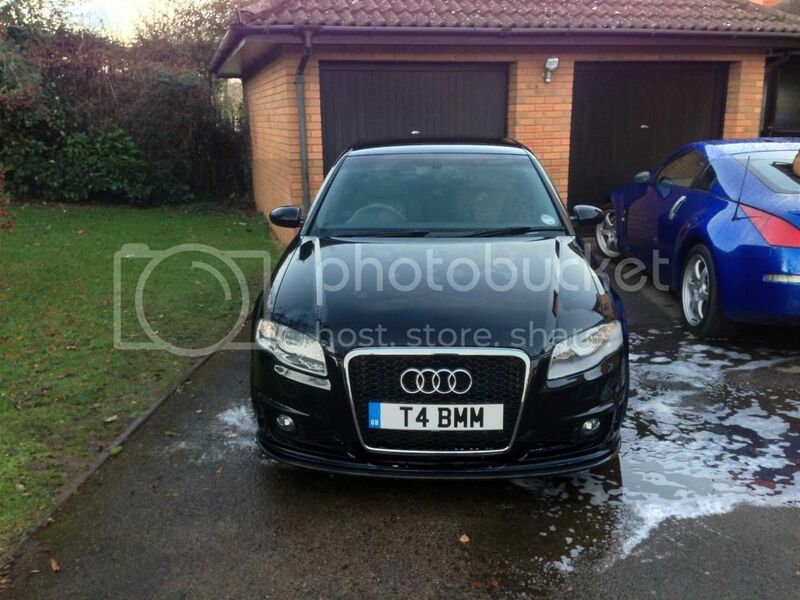 So Iv got OEM rotors, RS4 mirrors, S4 blades, front grills made from OEM RS6 and RS4 grills. The stance is thanks to some H&R 45mm lowering springs. Still got to sort out some spacers to just finish it off. That's why I liked your car. All parts are OEM , yet put together in a unique way. Follow my progress during the renovation of a 1930s bungalow. Will be kitted with multi-room audio and video throughout. Loving the car mate very very smart, was just wondering on the wing mirrors, where did you get them from and were they easy to change? DECTANE LED TAIL LIGHTS RED/SMOKE. thanks for the kind words. Still a few things left to do yet to get it where I want it. The mirrors were a rare find on eBay. They were from a bloke braking his crash damaged RS4. The d/s needed a new shell that I had to get from Audi and was a right pig to change. To fit them I had to take the top half of the doors off. You basically have to take the door card off and undo about 5 bolts and the top half of the door will pull up and out of the bottom half. There are a few guides on here and audizine that I followed to do it. It sounds daunting but its really not that much work. They really did change the look of the car for me and prob one of the best mods Iv done. All the wiring and mounting holes are the same as non RS mirrors so they are a straight swap. Hope this helps! P.S I see you're rocking a 350Z too! Nice motor also! Ave manage to find someone selling some wing mirrors I was wondering how much you paid so I know if what he is asking for is fair price??? Well I paid £280 for mine, but like I said one of them had a smashed up housing so was like £400 after getting a new cap from Audi and minus the cost of painting them. I have seen some on eBay in the past for £800 :O They are heated and fully adjustable so hate to think what they would be from a dealer! How much is he offering them to you for if you dnt mind me asking? Ha, yea I would ask for a picture of them to make sure they are B7 mirrors not b5 or not just the chrome mirror cap things that you can get. If it is legit £130 is a ****** bargain!!! car looks stunning pal, top work! Welcome to the RS6 grill club! Looks good, althought I would put a smaller plate on the front to accentuate the grill........what am I walking about, I did!!! Ha, great to be a member it was after seeing how good yours turned out that made me want to try it. I was after a smaller plate but I wanted a pressed aluminium euro style plate too. Can only seem to get them in the full sizes. You can legally make short plates on your reg - the legality is all about letter size and spacing...not plate size. I've 'downscaled' my plates, they're both currently 410mm x 90mm (standard is 510mm x 110mm).......shows off the grill nicely. are the D german stickers legal and the other 2 logo's legal on there? Yes, but only in Germany! may i ask, how do you keep the number plate on? What size wheels are they? And are they real or replicas? I also did mine recently! Looks great! Love your headlights as well! what make are they fella? Guys.... what the hell..... DTM bumper ? I thought S4 bumper is TOP OEM mod for A4 front, and this is it.... Is it rare ? Yes DTM is limited version and both bumpers are differen - i like only rear one but - different taste ! S4 it good but is look nearly like S-line outside ! DTM is just limited version with 2.0T engine only ! RS4 is the top version - interior exterior and engine ! 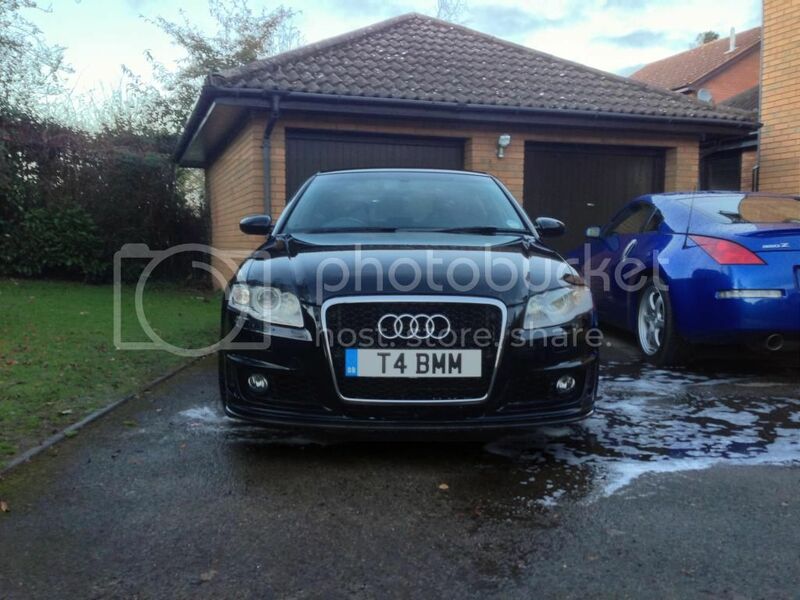 Audi S4 B8 3.0T supercharged - when dreams come true !